The City of Akron, OH took possession of the mall property, excluding the former anchors Target, Dillard's and Sears which house other businesses. JCPenney donated their building to the city to be included in the demolition process. This began on October 28th, 2016. The following videos were shot by fellow dead mall enthusiasts Dan Bell and Anthony of "Ace's Adventures" on YouTube. These videos capture the state of decline leading up to the mall's purchase, and showcases the need for such haste to get the building down once and for all. We were at this mall back in June of 2007 as part of the Malls "R" Us documentary filming. To see the mall in such a state of decay and neglect is bittersweet. Alas, it is too far gone to save and any further damage would only lead to more problems for this community going forward. To see drone footage capturing weekly updates on the demolition process, courtesy of Dawn Frank, click here. There were three malls when I was growing up in Akron. Chapel Hill, on my grandparents' side of town, was, at the time, outmoded and boring. It had no toy store, no software store, and was dreadfully dark and dreary. There was nothing there to interest a child. At Christmastime, they would set up a gigantic snowman named "Archie" to whom kids relayed their Christmas gift wishes (Archie was, the conceit went, a good friend of Santa's). A mall employee hidden inside conversed with the children via loudspeaker, as Archie's terrifying red eyes blinked. It was intended to enchant us, but we thought it was creepy. Summit Mall, in my neighborhood, was the utility mall. Dark, low-ceilinged, and reeking of cigarette smoke, it was the mall you rode your bike to, or went to with your parents on a normal, day-to-day, "let's go to the mall" basis. It had a toy store, a software store, a record store, a little arcade, a Burger King, and a pizza shop that my friends and I still insist had the best pizza anywhere, ever. It was a good enough mall, serviceable for most occasions. For special occasions, you drove a little further, to a hill on the outskirts of town, atop which sat a retail wonderland the likes of which, in Akron, in the 1980s, was unmatched. These were the days before Howe Avenue became a nonstop gridlock of commerce, back when Montrose was a dusty crossroads between four tracts of farmland. This was Romig Road, in its heyday. It was the only place with a Toys R Us. Oh, yeah. AND a Children's Palace. And a McDonald's with an indoor playground. Those things were rare back then. Most McDonald's restaurants had a couple of those weird fryguy rocking horse thingies outside by the picnic tables, but an indoor playground? It was the only one I knew of. And then there was the mall itself. Rolling Acres. It had two levels. Two! The other malls each just had one. To this day, Rolling Acres is the only mall in Akron with two levels. It had a food court! The other malls didn't have food courts. And the atmosphere... Light. Hope. Happiness. Skylights abounded, entire sections of ceiling were completely glass, with crisscrossed steel beam supports. Huge vaulted ceilings. The whole place was bathed in natural light. And there was a glass elevator! An actual glass elevator, like in Charlie and the Chocolate Factory. You actually did kind of feel like Charlie Bucket when you were six years old and walking around Rolling Acres. It was that kind of place. It was the mall. The mall you wanted to go to. A toy store, two software stores, a B. Dalton and a Waldenbooks, a food court, an arcade (a BIG one), green plants everywhere. And in the center of the whole thing was a gigantic fountain that resembled a futuristic city, with a dozen or so mirrored-glass skyscrapers from out the top of which gushed a billion gallons of water, surrounded by a moat of orange tile. I fell into that fountain more times than I can remember. I got lost in Rolling Acres once, separated from my mother and grandmother, when I was about four or five. Terrified, I bawled my eyes out until a pretty woman held out her hand and said "Come with me. We'll find your mommy." And we did. You were safe in Rolling Acres. Nothing could hurt you in Rolling Acres. There were pretty women around every corner, waiting to take you back to mommy if you got lost. Throughout my childhood, the Romig Road area, with Rolling Acres as its centerpiece, was the destination of most of my family's weekend shopping trips. My younger brother and I would suffer through the boredom of wandering the aisles of Handy Andy (a local big-box home-improvement chain), as our parents searched for light fixtures or countertops, to be rewarded later with a trip to Toys R Us, and most likely, a stroll through that shining mothership, Rolling Acres Mall. We'd ride in the glass elevator. We'd waste a few quarters in a Dig Dug machine. Maybe... if we hadn't eaten yet... playground McDonald's...? Yeah, Rolling Acres totally ruled. Then -sometime in the mid-90s- everything went downhill. Montrose, a vast neutral zone west of Akron, had begun developing in 1988 or '89, and hadn't stopped. Multiplex theaters went in, along with fast food, big-box stores, and specialty shops, and by the time I was in high school, what had in my youth been rolling countryside was now just a big strip of asphalt, glass, and concrete. Howe Avenue, the retail district near Chapel Hill, had undergone a renaissance and was now booming, rivaling Montrose in traffic. Chapel Hill itself would soon get a tremendous makeover, including the addition of a food court, that would see it transformed from a discount mall popular with the elderly to a hip retail center focused on the teen market. Summit Mall would get a similar revamping, having a food court added, the old brown smoky carpet ripped out and replaced by crŠme-colored tile, and a number of skylights installed to brighten the place up. It was rebranded as a more upscale, adult shopping center, which complemented Chapel Hill's youth-oriented complex. 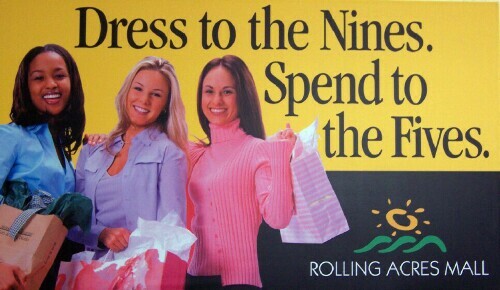 Akron now had a binary retail system that efficiently satisfied everyone. A mall n' sprawl to the west, and a mall n' sprawl to the east. To the North, seeming almost as penance for the pavement, a newly-designated-by-Congress national park. And, away south, festering rot and ruin. Occupancy at Rolling Acres dwindled in the '90s, and on into the '00s. The upscale shops left, replaced by discount outlets, dollar stores, and locally-owned retail experiments. Then came the churches (you know a mall is dying when the only entity that can survive within is one that doesn't have to pay taxes). There must have been three or four churches in Rolling Acres by 2003. The anchor stores of JC Penney and Dillard's became factory outlets, while Sears noticeably cut back its workforce and stock to only the bare essentials. The Target store, added in the late '90s in what was clearly an attempt to increase mall traffic, couldn't sustain itself and closed. What's more, the entire Romig Road area was decaying rapidly. Handy Andy closed. Toys R Us, Ames, Big Sur Waterbeds, Buddy's Carpet, Fretter. They all left. Children's Palace had long ago gone out of business nationwide, and that building had been bought by Marc's, a local grocery chain. But even that could not maintain profitability and eventually closed. Romig Road became a ghost town, with Rolling Acres Mall stubbornly clinging to life in the face of almost certain doom. Year after year, more closings. My friends and I made a game of taking trips to Rolling Acres every couple of weeks, trying to guess, on the ride up, which shops would be closed this time. Eventually, they turned off the air conditioning in the summer. Then, they turned the heat down so low in the winter that you could actually see your breath. Finally, they stopped even bothering to turn the house music on. They stopped repairing leaks in the roof and just put trashcans out to catch the water. They stopped caring when we took wheelchairs from the security station and raced them up and down the quieted concourse. Birds built nests in the steel supports of the great glass ceilings. We predicted that, when the operating license on the glass elevator expired, that would be it. Eventually, it did expire. They did not renew it. Within a few months, in the fall of 2008, we read in the paper that the mall would be closed to the public indefinitely. The JC Penney Outlet and Sears would remain open, which, now, in 2010, still are. A peek inside the front entrance of Rolling Acres reveals the rusty husk of the glorious centerpiece fountain, its mirrored glass stripped to be sold for scrap, its corroded frame sagging, its orange tile moat bone-dry and filthy. So... what happened? How did the retail superpower of Akron, Ohio crumble to nothing? To begin with, the area should never have been developed. People doubted the sustainability of a retail center on Romig Road years before they broke ground. The twin problems that never went away were simple economics and simple geography. Summit Mall and Chapel Hill, while outdated in the late '80s and early '90s, nonetheless serviced upper middle class areas of Greater Akron like Fairlawn and Bath in the west, and Cuyahoga Falls and Tallmadge in the northeast. Rolling Acres was built between the working-class town of Barberton, and the working-class, or outright impoverished, Akron neighborhoods of Kenmore and South Hawkins. You didn't have money surrounding the mall, and, let's be honest, some people aren't likely to drive 20 minutes to shop in a mall which customer base is 75% black, no matter how state-of-the-art the complex is. Rolling Acres had gotten a bad reputation in the early to mid-90s as a place where disgruntled urban youth with guns liked to hang out. The veracity of this is highly debatable, because in all the years my parents took us there, we never once saw one even remotely-suspicious thing. Yes, we did, indeed, see black people, but I don't recall them brandishing or discharging firearms. Most of them were (gasp!) shopping. Sadly, racist rumors played a big part in keeping away what had been Rolling Acres' and Romig Road's target constituency: upper middle class suburbanites. To make matters worse, Rolling Acres seemed far away. It wasn't, technically, "far away". But it sure seemed that way. Chapel Hill is farther from the house where I grew up than is Rolling Acres, but to this day, in my brain, that is not the case. Summit Mall and Chapel Hill are located along major arteries, within densely-populated commercial and residential zones, part of the contiguous metropolitan area of Akron. Romig Road was a somewhat integral street, and the freeway was close by, but it was surrounded almost entirely by undeveloped land, on a hill all its own. It seemed to be a satellite area somewhat cut-off from everything else. And that's the whole issue, really. Perception. Rolling Acres was perceived as being crime-ridden and distant, when, in reality, it was neither. The choice, in the end, for area suburbanites, whether justified or not, was between driving a short distance to one of the "safe" malls, or driving a long distance to the "unsafe" mall. I really believe this is the short answer to the question "Why did Rolling Acres fail?" Now Romig Road is going back to nature. It's incredible how quickly the process sets in, once human beings stop tending their creations. The asphalt cracks, and up spring shrubs, trees, and wildflowers. The ground opens up and swallows the old buildings. No doubt the floor of the mall is buckling up from root growth underneath. Surely the pipes are being rent asunder deep below where we cannot see. There are some holdouts; a Mexican restaurant, a strip joint, a salvage outlet appropriately named "Remnant Riot". But they cannot last forever. Romig Road is a remnant riot. A wasteland of all-too-recently discarded aspirations. And Mother Earth is happy to take it back from us. I only hope the other two malls don't follow a similar destiny. But it seems unlikely. They were there before Rolling Acres, and have suffered through their share of hard times, and bounced back. Rolling Acres was put through the wringer, and just couldn't cut it. It was an experiment, one that failed. What's funny is that this thing, created by people who probably didn't think twice about the long-term effect it would have on small boys, this thing that perhaps was fated to fail from the outset, this thing is one of the shining, golden pillars of the first decade of my life. When I was a child, I never thought things that big could ever go away. Rolling Acres, Fairlawn Elementary School, Cleveland Municipal Stadium. Things like that are indestructible, aren't they? But, no. They can go away. In a flash, or over many, many years. The colossi of our youth are no match for the minds of adults for whom such things are small matters in the face of financial stresses, personal health, and the burden of growing older. Those things are "real". Buildings are just objects, like pencils, or lightbulbs. You make them, use them, then discard them when they have outlasted their usefulness. Some buildings get passes, like the John Brown house, or the birthplace of Thomas Edison. Passes to outlast their usefulness in perpetuity. I visited those places, once or twice, when I was young. But I visited Rolling Acres several times a month, Municipal Stadium five or six times a year. I visited Fairlawn Elementary every day for seven years. We save the places we save because they have historic value. But whose history are we saving? I remember hearing the thunderous booms of the blasting some summer afternoons as rock was blasted with explosives to make way for construction. What could possibly be so big that would be coming to my crappy little corner of the world near Akron, Ohio? Rolling Acres opened August 6, 1975 with Sears and 21 other stores, as a perfect example of mid-70's mall design: Lots of orange tile, earth tones, chrome, and the like. At the center was the "Court of the twelve trees", with its unique stainless steel and orange-tile fountain surrounded by twelve indian laurel trees. Mod white plastic "circle in square" planters were placed throughout the center in groupings with blond wood topped benches supported by yet more white plastic bases. Zoo animal parking zone indicator signs ("giraffe", "turtle" etc.) were another feature that made the center somewhat unique, at least through the eyes of an eleven year old. What fun, and how easy to remember one's parking spot in "kangaroo" or "elephant"! The mall was absolutely filled with natural light, from giant skylights and those soaring ceilings throughout. This was refreshing, compared to the perenially dark, dim, and by now dated Summit Mall or Chapel Hill, and before the days of those continuous barrel-vaulted glass ceilings that would soon be in fashion. I vaguely remember some kind of hokey tie-in to the "Egyptian sun God Ra" supposedly having something to do with inspiring the mall's logo of the sun embedded in these mod '70's earth-tone hills. (RA = Rolling Acres, get it?) Promotional materials at the time of the mall's opening described "Ra, the friendly giant of Rolling Acres", who along with Miss Ra would have a gift for all the small fry. Ads describing the mall's future phases even promised a "yellow bubble elevator". Wow! To a poor 11-year old kid growing up in the depressed industrial town of Barberton, this was like a fantasy world, all new and sparkling and bright and light compared to an otherwise gray and declining area. The state-of-the-art JCPenney opened sometime early in 1976, really giving the mall momentum .It became the place to go, and before long zoomed in popularity to become Akron's dominant center, crowded every weekend. One of the other unique features of the mall were the three giant "sunken gardens", which, to a curious kid, were just that: Huge rectangular vertical depressions with '70's-looking striping painted on the walls, loose river stones on the floors, and various plants arranged throughout. It later became known that in the future, the walls would be removed from these, and they would become openings to the lower level with more stores and restaurants. I well remember the smell of KarmelKorn permeating through the skylight court by JCPenney, hot dogs from Der Dog Haus, the candy counter at Sears, cafeterias in both JCPenney and later Montgomery Wards, York Steak House, Friendlys, Cut The Mustard, and later Samir's and The Terrace at O'Neil's. Around 1977 came the "Court of Aquarius" with a giant aquarium in front of the new Montgomery Ward store. I was always struck by how hard the benches were there. They seemed to be plywood covered with low-pile commercial carpeting, surrounded by all sorts of lush plantings just a few steps down from the Aquarium. At the opening of this phase of the mall, an ad appeared in the Akron Beacon Journal with a large group employee photo, claiming that Rolling Acres was the first mall in the world to contain Sears, JCPenney, and Montgomery Ward. Directly across from the aquarium was "Pizza Star" which I remember for having wild black and white pop art graphic wallpaper, and FM rock radio playing as diners ate pizza on the molded red formica booths. Also located near here was the "Rivet" store, which was a jeans chain owned by the O'Neils / May department store chain, and positioned as an alternative to The Gap. Jeans stores were the order of the day amongst my high school peers, with The Gap, County Seat, Bottom Half, Jeans West, and Rivet all maintaining a presence at Rolling Acres. Perhaps the biggest step in the evolution of the center was the 1978 opening of O'Neil's and the "Promenade Level", including the "Prom-N-Eat" food court, the first mall food court in Akron. Due to the sloping topography of the mall site, Rolling Acres is a single level on the northern end, and multi-level at the south. The new lower level consisted of lots of mirrored-glass surfaces in the escalator wells, on vertical supports, and the front of O'Neil's. What was to be the yellow bubble elevator was all chrome and glass by the time this phase of the center opened. A central feature by the escalators in the court in front of JCP was a strange towering stainless-and-plexiglass fountain with little holes drilled into the bottom of plexiglass troughs for the water to cascade down to succeeding levels of clear plexiglass troughs, and eventually to the pool at the base. Coins used to get thrown into the plexiglass troughs, clogging up the holes. This created a maintenance task, causing the fountain to be under repair often, and eventually the whole thing was removed, only to be replaced by a bland fountain spout not unlike what you'd find in a garden pond kit today. A three-screen cinema opened on the lower level near O'Neil's at this time, and a sign by the big windows on the upper level at the end of the concourse opposite JCP promised a "fifth great department store" coming soon to this part of the mall. Sometime around 1985 it was announced that Montgomery Ward would be closing, but would be replaced by Higbee's, which eventually became Dillard's. Around this time, the giant aquarium was removed (probably another maintenance headache), and a remerchandising effort took place, especially in the concourse leading to the new Higbee's, consisting of several new stores like Limited Express, many of which were "bumped out" into the mall to be more visually arresting. Does anyone remember how Au Coton and even the trendy Italian chain Bennetton made appearances at Rolling Acres, however brief? Much of the mall's 1970's essence and personality was lost at this time though, as the earth tones were tossed out in favor of a coat of what appeared to be pale pink. The sun god logo gave way to a blooming flower, and teal and purple appeared in the mall's graphic materials at this time as well. I guess the "Miami Vice" fashion of the day influenced those in charge of the makeover. The orange tiles in the main fountain stayed though; it would probably have been too expensive to replace them. Sadly, the zoo animal parking-lot indicator signs were replaced by generic A-Z letter designations. Prom-N-Eat gave way to Picnic Place with a vaguely Victorian tile and brass trim look that seemed out of place amidst all the '70's era architecture of the center. Cargo Express, which was kind of a low-end version of Crate & Barrel was very popular across from the food court at this time. The late 80's and early 90's saw many changes in the American retail landscape. Many chains consolidated or went out of business. The huge, recently redone Merry-Go-Round store closed at this time as the chain liquidated. Chess King, County Seat, Petrie's and many other entire chains went out of business at this time, and this led to a lot of closings at Rolling Acres. It seems hard to believe, but it was as recently as 1995 that Target opened in a new extension of the mall's lower level west of the food court. It seemed kind of odd at the time to have a discount store in the mall, but this somewhat fulfilled that "5th great department store" promise from long ago. There were a few other bright spots for the mall at this time, namely a short-lived Sbarro's in the former Friendly's location, Bath And Body Works, Victoria's Secret, and an expansive, glassy new Lane Bryant came in as well. JCPenney eventually became the JCPenney catalog outlet store. This, and Target became my only motivation for ever going there. Probably the beginning of the end for Rolling Acres was the multi-million dollar 1997 renovation of nearby Summit Mall. This mall, although much smaller than Rolling Acres, is in the booming Fairlawn / Montrose area, a much more desirable location demographically speaking than Rolling Acres which is surrounded by blue-collar Barberton, Norton, and low-rent neighborhoods of Akron. Summit was acquired by Simon, which removed the mall's ugly brown carpeting, put in an abundance of skylights, created a food court, and brought in upscale shops like Williams-Sonoma, Banana Republic, and Starbucks. The turnaround at Summit has been a smashing success, as witnessed by its near 100 percent occupancy and steady throngs of shoppers. Rolling Acres' ownership changed twice since about 2000. The first sale saw the mall's original owners relinquish the property to the mortgage holder, Bankers Trust, who in turn took a hit north of 20 million dollars in selling to the current owners. Bankers Trust brought in a management company to reposition the property for sale, but this basically consisted of another new logo, slogan, and a coat of white paint outside the main entrance. The current owners have been content to let the property decline further as they seek to resell for a profit on their investment. In February, 2006 Target relocated to a new store in a strip center seven miles west in Wadsworth. The inline stores are virtually all gone, and the mall has a deserted, eerily quiet vibe to it, with the cheesy canned music seeming louder than ever with the crowds long gone and fountains shut off. It gives me the creeps to walk through this empty place today, remembering what it once was. Rolling Acres initially succeeded because it was the newest, biggest, and brightest place in town. And department stores with small shops were the only game in town. Apparel offerings at the discount stores were obviously second-rate at the time, nothing like the Targets and Old Navys of today. There was no TJ Maxx, no Outlet Centers, no Gabriel's or other off-price stores offering mainstream goods at lower prices. The mall was where everybody went. In retrospect, there was probably only room for one major center on the West side of Akron. Rolling Acres sits on a huge site compared to the land-locked Summit, and was at its peak while Summit was being neglected. Now with Summit apparently flourishing, Rolling Acres continues its long decline. Now that the Target traffic is gone, how long will the remaining anchors stay? With all Kaufmann's set to become Macy's, it would not be surprising to see Macy's pull the plug before putting the new name on that store. Dillard's is now a sparsely-stocked "Clearance Center", and the crowds are getting thin at Sears and the JCPenney Outlet. www.myspace.com/rollingacresmall - The Mall Has It's Own MySpace Profile!